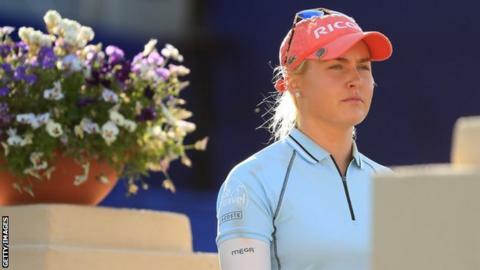 A yellow dress might prove as inspirational as a green jacket for England's Charley Hull who is seeking to emulate Danny Willett's major breakthrough this year. Of course, British golfers of both sexes are trying to harness the inspirational effects of the Yorkshireman's thrilling Masters victory. The feel-good factor was evident with Middlesex professional Andrew Johnston's maiden European Tour victory at the Spanish Open, while Luke Donald and Russell Knox produced their best golf of the year as joint runners-up behind Branden Grace at Hilton Head on the PGA Tour. Hull, meanwhile has found a new mental state that might yield British glory on the women's circuit. It has already brought a second-place finish in the year's opening major, the ANA Inspiration. It was the finest performance to date from the 20-year-old Northamptonshire star, although the draining effects of the return journey from California robbed Hull of the chance to watch Willett's win live. This will not, though, prevent her from drawing on the positivity generated by his triumph. "I did fall asleep because I was so tired from jet lag," Hull told BBC Sport. "But I watched a re-run and he played some great stuff. "When you sit down and watch them doing it, you know that feeling of what they are thinking. "And it kind of inspires me for the next event to get that feeling again." The world number 25 struggles to articulate what it feels like to be in that unique zone when you are competing effectively for the biggest prizes. A week before the Masters, she birdied the last four holes of her third round on the Dinah Shore course at Rancho Mirage and birdied five of the last 10 to finish just a shot behind world number one Lydia Ko. "You really want to do well but you are not thinking about it," Hull said. "And you make some birdies coming in and then you are thinking I never got ahead of myself." When she tried to explain this mental state, she made a startling confession of how it manifested itself during her highest major finish. This is where the yellow dress comes in. "I don't think about golf when I'm actually on the golf course," she said. "I just kind of go with the flow and just hit my shot when it's ready and don't think about it after. "I got told off by my caddie [Adam Woodward] at the ANA on the 13th hole. I was on my tee shot and I'm really bad at listening to people. People talk to me and I'm like 'what did you just say?' I'm a bit dazed. "So I teed up this shot and I was actually thinking about this dress I had ordered. This is so funny, it's a yellow dress I ordered, and I'm thinking about it. "And that's what I have been doing lately and it's been working for me. Sometimes I used to get so far ahead of myself. It's interesting, it's weird." Referring to recent events at Augusta where Jordan Spieth blew a five-stroke lead with nine holes to go, Hull added: "If you look at Spieth, he said if he played level-par in he would win and he got ahead of himself. "I used to do that a lot but now I just go out there and think if I made birdie on the last hole I can make birdie at the next." Britain's top woman golfer is back in action on the LPGA Tour in Texas next week but looming further on the horizon is an event which will test to the limit her unorthodox form of concentration. Hull will be the star attraction at July's Ricoh Women's British Open, staged at Woburn, her home club. I played alongside her as she sought to further familiarise herself with the Marquess' Course and it was impossible not to be struck by her carefree attitude. Hull says her caddie has told her to "start concentrating"
Her biggest concern was whether the soggy track would be open the following day for a game she had arranged with friends. All that would be at stake would be bragging rights in their local pub. Yet, it was clear Hull was as motivated to win that contest as she might be in July when a major title is on the line. She accepts that home advantage may be compromised and not just because the Kettering player usually practises on the other two Woburn courses, the Duke's and the Duchess'. Maintaining her "zoned-out" mental state will be "super hard to do," she said, explaining: "Because when I'm away I'm usually thinking about home or something. Now I'm going to be at home so it's going to be tricky. "Hopefully my friends will be around, so it'll take my mind off it. It's a major on my home golf course and my sponsors back the tournament, so it's a lot of pressure but I think it is going to be fun." At Augusta, Willett certainly showed how enjoyable it was to gain a new green jacket. Perhaps Hull should put in another clothing order this July because thinking about its arrival might just help her land a first major title. Never want to miss the latest golf news? You can now add this sport and all the other sports and teams you follow to your personalised My Sport home.